Here's a summertime dish that I am in love with at the moment. 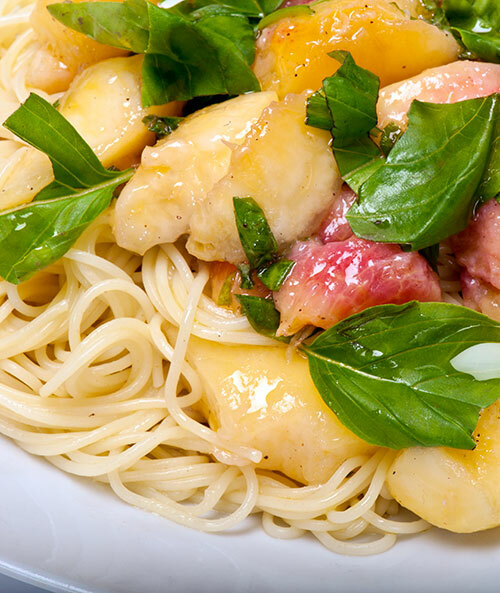 Peaches in a savory pasta dish may sound odd, but it really works. I saw a version of this dish on a Japanese TV show a few weeks ago, and thought it sounded odd but intriguing. Indeed it is. The ripe peaches are like the best, juiciest fresh tomatoes ever, and the salt, basil and olive oil turn the sweetness around totally, making it a wonderful savory dish. The one big requirement of this recipe is that you simply must have good, juicy ripe peaches or nectarines. If you make this with unripe, hard peaches or those awful woolly peaches it will not work at all. You should also use very fresh basil leaves just picked off the plant, the best extra virgin olive oil you can afford, and a good salt. I think this works best with a thin pasta like cappellini or vermicelli, maybe spaghettini, altough you can try it with very thin handmade noodles. It can be served warm or chilled; I think it tastes peachier when warm, but it's very refreshing cold. It works really well as a first course - and since I'm not allowed to have big portions of pasta that's how I've been enjoying it. Boil the pasta in salted water following package instructions until al dente (just a bit firm). While the pasta is cooking, peel the peaches by dunking them in boiling water for a few seconds (tip: you can just use the pasta water for this) then slipping the skins off. Cut the peaches up into rather big chunks, making sure to keep any juice that drips out of them..
Rip the basil leaves up with your hands, or finely shred them with a knife.. Put the cut up peaches, juice and all, into a bowl and toss with the sea salt and 2 tablespoons of olive oil. Put the cooked and well drained pasta in a bowl. Add the peaches with the oil and juice and toss well. Add the basil leaves. 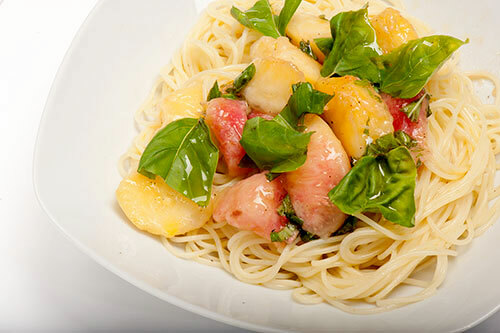 Taste the pasta and peaches and add a bit more salt if needed. It should taste a bit salty but yet sweet. Add a few grinds of black pepper. Serve warm or chilled, drizzled with the remaining olive oil. If serving chilled, leave the basil leaves out and add them just before serving. Use two kinds of peaches - white and yellow - for added color. This is just a variation on the classic caprese - tomatoes and mozzarella with basil. Just use sliced peaches instead of the tomato combined with mozzarella (a nice soft and jucy buffalo mozzarella is best), plus basil, olive oil and salt. Submitted by maki on 2013-06-28 12:03. Thanks, Maki! I was just trying to figure out what to do with the peaches leftover from that pie I made. I haven't tried it, but this should work pretty well with mangoes too. There isn't a fruit I don't like, but Japanese peaches may just be my favourite.....winter here, but the thought of this dish is a vicarious delight. Thank you for sharing. When I make reimen I usually include fruit, (peaches are great) ...... I think I'd be inclined to serve the pasta chilled as you suggest. Mind you, I don't like the conditions in Japan when the peaches are wonderful. It was always with relief I spied nashi heralding the days beyond 熱帯夜. Have you been in Japan or do you have a way of watching Japanese TV in France? NHK World is available here at great expense, that, and the fact I can't bear the English they use mean I don't bother with it. I do roam round on YouTube from time to time looking for interesting things in Japanese, but if you have any suggestions, they would be welcome. This is very healthy. Can we use doughnut peaches for this recipe? Sure, ripe donut peaches should work fine. Now, that is a totally different pasta recipe! Thank you for sharing! HAH! It just so happens I have peaches, basil, and mozzarella, and tons of pasta, and I feel to lazy to make pesto. Good timing, Mako! I bulked this up with some gorgonzola and walnuts. Om nom nom. Sounds great! If serving cold, do you recommend rinsing the pasta after cooking? You can rinse it if you are in a hurry and want to cool it down fast, otherwise you can let it cool down on its own (with some of the pasta water mixed in to prevent sticking).